OpenStack is an open source project that we at Combell follow closely. For that matter, we launch our own cloud data centre product based on OpenStack. To put it in simple terms, OpenStack is an extra layer that you can add on top of your virtualised environment. It is a sort of cloud orchestration platform that adds a layer on top of the existing virtualisation technology. It can be VMware technology, which is the most renowned, but also KVM, the open source virtualisation technology. We at Combell use KVM as a hypervisor, the application that is used to simultaneously run multiple operating systems on single physical server. As a customer of Combell, OpenStack allows you to have a data centre at your fingertips, without having to invest in metal. Thanks to the built-in APIs (Application Programming Interfaces), you can e.g. send a request to your virtual data centre to, in addition to a virtual server, make a change at network level to a router, a firewall or a load balancer, since they are part of the virtualised environment, simply by sending a POST request to the REST API. This is how we at Combell are able to offer you a virtual data centre, for which our customers can rest assured that their data are stored in their country. So, we provide proximity combined with the scalability of the cloud, which means that you can e.g. very easily and automatically activate (or deactivate) five extra virtual servers when your application needs it. And you just pay for what you use! Templates are another key benefit of OpenStack. You can use templates for each action that you perform. In the past, you needed to configure a virtual server, which took quite a lot of time (exactly as when you had to configure a new laptop you just bought before you could use it). Such a new server requires an operating system, but you cannot start working with it until all the services that are required to support your application are configured, like e.g. web servers, database servers, etc. Another great benefit is that OpenStack enables you to define the layout of a server in such a template and, based on this, have the virtual server automatically installed. That makes the entire process much easier and quicker. One more benefit of these HEAT templates is that, based on some presets, you can automatically scale up your environment without further action. You can e.g. choose to install your application or website on a single server and use a template so that the OpenStack system automatically installs two additional servers when you first server can no longer handle the traffic alone. As soon as traffic is back to normal, the servers that have been added automatically are automatically removed. For this, you are free to adjust the settings (via the API) as you like. The third benefit of OpenStack is that it is an open source project. The technology is available to all, and not through a specific supplier. It also allows Combell to fully meet its final customers’ needs. We at Combell have two types of customers. On the one hand, there are customers who use the web interface so that they can, so to speak, manage their own data centre in a very user-friendly manner. And on the other hand, there are developers who use APIs to optimise their continuous deployment process. So, supplying an application via technologies like FTP or SSH has become a thing of the past. For each application, you can make a package that will be installed automatically when you configure a virtual server (using templates), for which all the settings have already been adjusted for the application you want to configure. This way, you can very easily create a staging environment that is identical to the final production environment. Will everything be about OpenStack at Combell now? Definitely not! An important thing to remind is that, in the future, we will (continue to) focus on both OpenStack and VMware. The choice between these two technologies depends on the application for which one of both is used. Obviously, we help our customers make the right decision. A very interesting metaphor for the approach used in a data centre is that of pets versus cattle, as the same thing applies to IT infrastructure and servers. 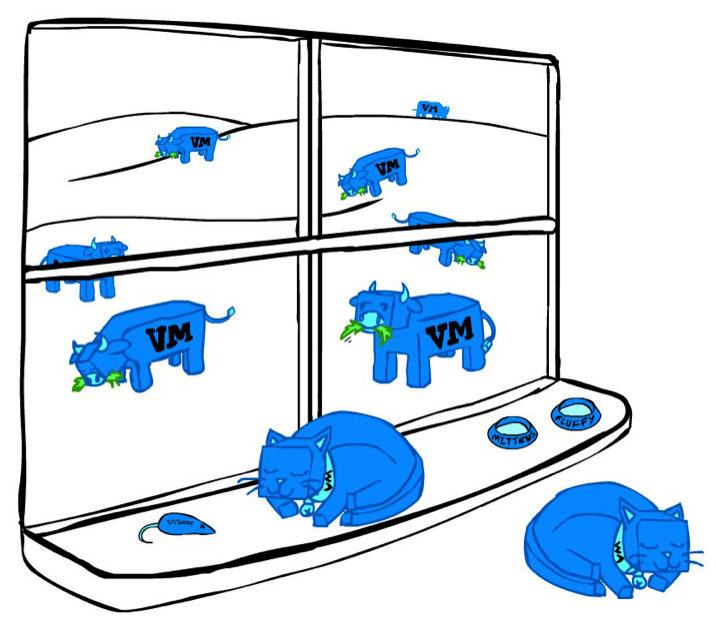 If your virtual machine is e.g. crucial and can never fail for the proper operation of your application, VMware is the best choice. Possible problems are then solved, just as when you take your pet to the vet. On the other hand, when the ability to scale out is what matters, many companies go for the “cattle approach”. This means that a virtual machine can be removed and replaced without affecting the smooth operation of the application. Exactly as a farmer does with his livestock. So, your choice depends on your application.